Craig Keeland is a 5th Generation Texan who graduated from The University of Pennsylvania’s Wharton School of Finance and Southern Methodist University’s Cox School of Business. His lifetime passion has been about Leading Others to Better Health and a commitment to Helping Others Reach Their Lifetime Goals and Improve Their Character. Craig Keeland earned his M.B.A. at the Wharton School of Business in the Ivy Leagues at The University of Pennsylvania. He began his professional career in banking and finance, achieving great respect from his professional peers as Founder and C.E.O. of the Heritage Corporation of America and Chairman and C.E.O. of Guaranty Bank, Dallas. As a Financial Consultant, Craig worked with several billionaires and was valued for his financial expertise and guidance. In 1991, Craig asked how he could experience Feeling Younger Longer and in excellent health. He immediately set out to uncover the secrets to a long and healthy life. To that end, he founded his own health and wellness products company. He gathered a team of world class scientists to achieve the goal of creating a good tasting, antioxidant rich, whole food puree that would support a state of wellness. Since 2003, Craig has developed and launched a family of “Antioxidant-rich Whole Food Puree” products manufactured and distributed by his CK Family of Companies which includes: Doctor’s Wellness Solutions, Trinity Nutraceuticals and Liberty Franklin Pharmaceuticals. Craig’s CK Management organization manages the business of the CK Family of Companies and their “Antioxidant-rich Whole Food Puree” products. Craig, Claude, Cassidy, and Chase Craig’s grandparents worked at a Dallas dry cleaning and laundry establishment which, over time with dedication and hard work, they were able to purchase and run as their own company. Louis ran the day-to-day aspects of the business while Pauline handled the financial and payroll for the company. Craig’s father Claude B. Keeland, Jr. was born in a small East Texas town. After a stint in the United States Air Force, Claude worked as a business manager for a wealthy family. He was a saver who used his savings to found a commercial bank. After starting one bank, Claude bought two more banks in small Texas towns. Eventually, Claude sold these banks, moved to Dallas and purchased an existing bank that he grew into a highly successful venture. Claude Keeland was active in business and educational organizations that helped the community. Craig’s parents met in Dallas after Craig’s mother graduated from Southern Methodist University and worked for the Campfire Girl organization. Craig grew up in Dallas, graduating from high school in a class of 365. He likes to say he graduated sixth from the bottom at 359 which gave nearly everyone else in his class a leg up so they could graduate with a better class standing. In spite of his class ranking, Craig always had a drive to work hard. Summers found him throwing papers, mowing yards and working in various departments in a Dallas bank. As far back as he can remember, Craig always has been motivated to work and feel a sense of accomplishment. During Craig’s high school years, he would sneak into a business class at Southern Methodist University to attend speaking events given by highly successful entrepreneurs. The Tuesday night schedule featured entrepreneurs like Norman Brinker, C.E.O. of Chili’s Restaurant; M.B. Zale, founder of Zale Jewelry; and James Ling of the LTV Corporation. Craig never missed a Tuesday night session and the opportunity to learn from these gifted men. After high school, Craig attended and graduated from Southern Methodist University with a degree in business. He then was accepted to the prestigious University of Pennsylvania Wharton School of Finance where he earned his M.B.A. He returned to Dallas to become the financial advisor for L.D. Brinkman, a successful Dallas businessman who was the C.E.O. of his own company. Craig then founded Heritage Corporation of America. He sold that company after three years and bought a controlling interest in a bank, following the footsteps of his father. Nearly four years later, Craig left that bank and found himself in the middle of the Texas oil, real estate and banking collapse. Many lost their fortunes during this time, and many had to declare bankruptcy. Though Craig suffered multi-million dollar losses and was deep in dept to investment loans, he paid back every singe cent that was loaned to him over the course of five years. Craig and Former Governor of Texas (2000–2015) Throughout his adult life, Craig has been an avid consumer of whole foods, vitamins, herbs and minerals for health. His increasing interest in health and nutrition led him to ask how all of us could extend health and wellness throughout our life spans. After extensive research into longevity and wellness, Craig became convinced that everyone could live and feel younger longer and have healthier lives. He dedicated himself to creating a single product that would allow everyone to Feel Younger Longer. He has been on a mission to manufacture and distribute his product since 1991. 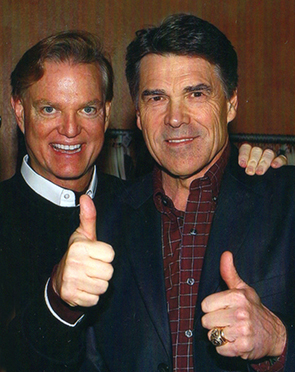 Because of his commitment to health, Craig was appointed to serve on the Governor’s Advisory Council on Physical Fitness in 2008 by Rick Perry, Governor of Texas. 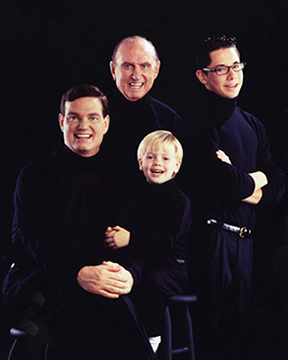 Craig has two sons, Cassidy and Chase, who are the joy of his life. Craig has held three goals for his children – become Eagle Scouts, achieve the rank of black belt in martial arts and experience selling books door-to-door for a summer. Craig’s eldest son Cassidy became an Eagle Scout, achieved a brown belt in martial arts and sold books door-to-door for two summers! Cassidy is a graduate of Southern Methodist University. Bicycling is both his passion and his career. Craig’s younger son Chase achieved his black belt, his Eagle Scout rank and is looking forward to college. Craig has one sister Kay Keeland. Kay has a daughter Caroline who Kay adopted at birth. Craig says, “I was excited to have children and prayed that my children would be healthy. My boys are a joy to my life. I don’t recall them ever going through the “Terrible twos” or ever behaving badly. They always have been polite, perhaps because I took them everywhere with me from day one. I also taught them to be independent thinkers so if I were not around, they could thrive on their own and not just survive.